The Jacksonville Jaguars look to build off a week 1 victory over the New York Giants by a score of 20-15. The powerful dynasty New England Patriots come to town in a highly anticipated week 2 matchup. This game is a rematch of the 2017 AFC Championship game from this past January. The Patriots are also coming off a week 1 victory over the Houston Texans by the score of 27-20. The atmosphere in Jacksonville will be electric. Jaguars fans have been looking forward to this matchup since the Jaguars lost in January to the Patriots. 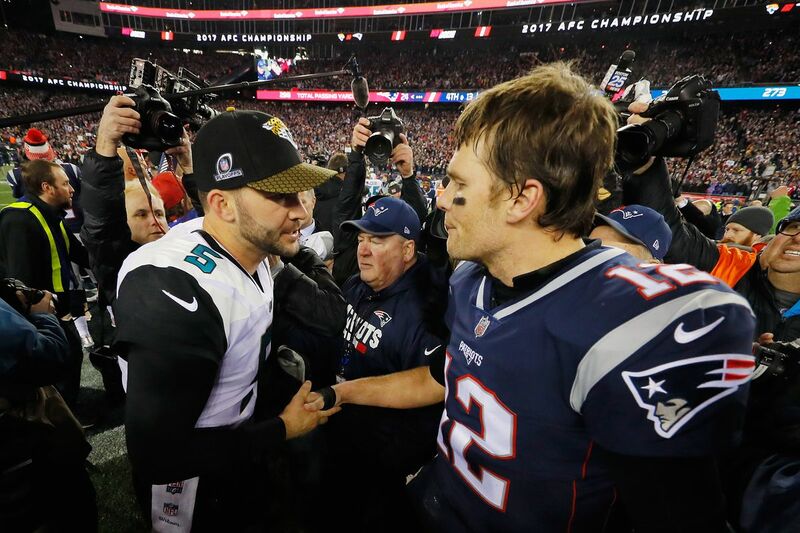 This matchup could very well determine homefield advantage in the playoffs this year, as the Patriots are an annual playoff team, and the Jaguars have very high expectations of going back to the playoffs, and possibly a Super Bowl. Kickoff between the Patriots and the Jaguars is scheduled for 4:25 pm at TIAA Bank Field. Jacksonville is 1-11 all-time versus New England, with the last meeting coming in January 2017 in Gillette Stadium, home of the Patriots. The Jaguars lost 24-20 and missed out on heading to the Super Bowl. The Patriots are 7-0 in the regular season against the Jaguars. Patriots quarterback Tom Brady and Head Coach Bill Belichick are each 5-0 in the regular season against the Jaguars, and are 8-0 all time against the Jaguars, including postseason. Will the Jaguars use Corey Grant in the rematch? In last year’s AFC Championship, the Jaguars used Corey Grant in the playcalling in the first half and it was done to near perfection. However, in the second half of that matchup, Grant was non-existant, and that drew criticism from Jaguars fans. Many fans draw conclusions that because Grant was not used more in the game in the second half, that led to the offense stalling and led to the Patriots taking control and winning the game. The Jaguars barely used Grant last week once star running back Leonard Fournette left the game with a hamstring strain. With Fournette’s health in question for this week’s matchup, will Grant be used more along with running back T.J. Yeldon? Or will it just be Yeldon and Fournette, should Fournette suit up. The Jaguars have to be diverse in their playcalling and include Grant, as the Patriots had no answer for him in the first half of last year’s matchup. As mentioned earlier, Fournette is battling a hamstring strain. He left midway through the game last week and never came back in. Fournette said himself after the game that he will play against the Patriots, but the team is taking this injury seriously. He missed practice Wednesday and Thursday.. If Fournette does play this week, do not expect him to be at 100%, and expect more of Yeldon and Grant to help complement Fournette. No receiver stepped up last week for quarterback Blake Bortles. No one established themselves as the true number one option. This will be a storyline to watch through at least the first quarter of the season to see if either Donte Moncrief, Dede Westbrook, or Keelan Cole will step up to help Bortles and this offense. Can the Jaguars stop Rob Gronkowski? The star tight end for the New England Patriots will go into the Hall-of-Fame whenever he decides to quit football. Gronkowski left last year’s matchup late in the first half after a helmet-to-helmet hit delivered by Jaguars safety Barry Church. Gronkowski is a physical freak and is one of the hardest people in the NFL to bring down to the ground and also one of the hardest people to cover due to his physical stature. Gronkowski had 7 catches for 123 yards and 1 touchdown last week against the Texans. If Gronkowski has that type of day against the Jaguars, it will be a long day for the Jaguars defense. Slowing down Gronkowski will be something that defensive coordinator Todd Wash will have to figure out. What else is there to say about the New England Patriots? The Patriots are currently 1-0 and are coming off a season where they lost to the Philadelphia Eagles in Super Bowl 52. The Patriots do look a little different from when they took the field back in February for Super Bowl Sunday. Defensive coordinator Matt Patricia left for a head coaching job in Detroit. The Patriots did not bring back pivotal names Brandin Cooks (trade-Los Angeles Rams), Danny Amendola (free agency-Miami Dolphins), Malcolm Butler (free agency- Tennessee Titans), Dion Lewis (free agency-Titans), and Nate Solder (free agency-New York Giants). In addition to all those notable players leaving, the Patriots will be without receiver Julian Edelman, who is currently suspended for the first four games of the NFL season for violating the NFL’s performance-enhancing substance abuse policy. This is a new look Patriots team but is always one to threaten for a run at the Super Bowl every year with Brady at quarterback and Belichick as head coach. As mentioned, Gronkowski against the defense is a pivotal matchup to watch. However, it is not the most critical. The most critical matchup is between the trenches. The battles between each team’s line units will be the key matchup to watch. In last year’s matchup, the Jaguars defense sacked Brady 3 times, and hit him 7 times. The Patriots sacked Bortles 5 times and hit him 8 times. Whoever gets to the opposing quarterback more often and causes duress in the pocket will win this game. From observing the Patriots for the last decade and a half, the way to beat the Patriots is to get Brady to the ground as many times as possible. If the Jaguars do this, then they will be in great position to win. Get after Tom Brady. Don’t turn the ball over. Involve the crowd. Frank Frangie, Tony Boselli and Jeff Lageman will provide the call on 1010XL and 92.5 FM with Rick Ballou working the sidelines. It’s the fifth season of the Jaguars being on Jacksonville’s sports superstation. The Patriots-Jaguars will air on CBS and locally on WJAX 30 at 4:25 p.m. Sunday. Jim Nantz will provide the play by play with Tony Romo for color commentary, and Tracy Wolfson reporting from the sideline. The Jaguars will be wearing their teal jerseys over their white pants.